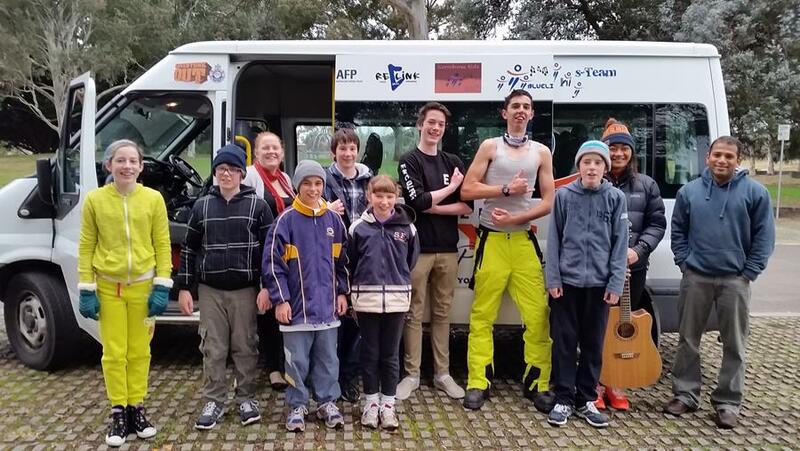 In August we took a bunch of Canberra youth and leaders up to Mt Selwyn to join up with groups from Fusion Riverina, Orange and Blue Mountains for a huge day of snow craziness. This is one of our almost traditional youth adventure daytrips and was a great day of making new friends, trying challenging things to stretch us, and all in a positive environment with leaders who will take the time to listen to what life is like for the young people. We're hoping to join up with other daytrips in 2016. A huge thanks to Ivan our bus driver, Naomi our Chaplain who lead the day, and Izzy and Hassa our other leaders. You are all champions! 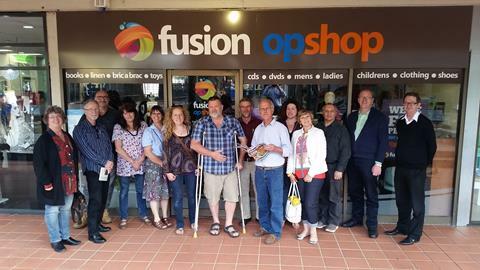 During the October school holidays Fusion Canberra hosted Fusion's Board of Trustees. There are 9 Trustees for Fusion Australia, 6 of these are Fusion staff or volunteers and 3 are external trustees. The Board meets every month, but only every second month do they physically meet at a Fusion Centre. The other months they meet online. It was fantastic to host them, and thanks to some very hospitable volunteers and Friends of Fusion, we were able to billet all those needing billets without needing to spend extra money on hotels! This had the added benefit of Trustees being able to meet some more of our team members and get to know them. One outcome from the Board's deliberations in October was to discuss our centre and to recommit to ensuring Fusion continues to operate in Canberra when our team leaders, Brenton & Claire Reimann, move onto different roles in Fusion and interstate to South Australia next year. We look forward to welcoming the Board back again in the future! One of my favourite moments of this year was witnessing a student use her passion for song writing as a substitute for wrist cutting. "Liz" comes from a really rough background and hasn’t been coping well this year. Her father is no longer around, and so the student struggles to get along with her step-father. Her mother however, is currently ill and so it’s been challenging for her to focus in school. There have been many occasions during last term where Liz disclosed to me that she wanted to run away from home, and to commit suicide — all because she was dealing with too much at home and at school. She has also been a victim of bullying and is still trying to cope with that. I remember when Liz first shared her story with me, I tried so hard to keep my tears in, I was angry, and frustrated because I believe that no one deserves to go through the things she has had to, and so I’ve been spending a lot of time with her — in and out of class. What I have learnt is that Liz just wants to be recognised and be appreciated, and that is something I’m am so grateful to be able to help with. She used to cut herself a lot back then, and so we had a few discussions about that. One day I asked her “what makes you happy? What do you love doing?” and she replied, “I like to song-write.” Then she pulled out some of songs she wrote and showed me and I was amazed. So I started to compliment Liz's songs, to help her become aware of her potential, to recognise her, to appreciate her, and since then I have seen such an incredible shift in her attitude in school. It is these types of stories that I get to be part of that Fusion has opened up for me, and it is such a blessing to even be present in the school itself. The need is overwhelming, but the opportunity to see students overcoming their difficulties and growing towards their amazing potential makes my job so worth it! The last few months have been exciting with new ventures being explored. Firstly, we have added to our team of volunteers a small group of ‘After School Care’ children, from Years 5/6. They come once a week during the school term. The numbers vary a little as do the children who come. Together with their supervisor and our staff members, these young children enjoy the experience of being in a ‘working’ environment. 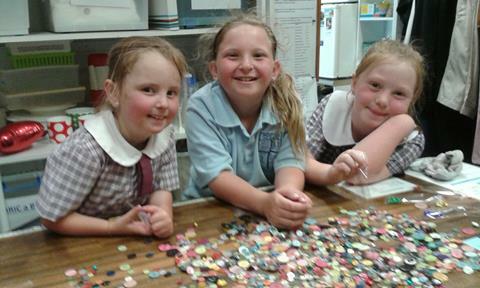 Enthusiastic and with big smiles and laughter they set about their given tasks challenging each other as they work. This venture has added an interesting challenge for our team – providing suitable and interesting tasks for them. This is being met with equal enthusiasm on the part of our team and the collaboration is working very well as both children and our team members are enjoying the experience and the challenge of different scenarios. Secondly, Fusion has entered into an agreement with the ‘Work for the Dole’ Program. This program would see us being able to place a currently unemployed person onto our roster and become part of our team for a period of at least six months. The team is very supportive of this initiative as it provides this person with a very real opportunity to gain paid employment in the future by learning new skills and being part of a team. Interviews commence this week and we hope to be able to welcome someone as soon as possible. We look forward to this newest venture and hope that its success will lead to Fusion being able to offer further positions in the future, possible in other areas of our activities. What a great way to finish a very successful and rewarding year at Fusion Hand to Hand. We look forward with enthusiasm to the challenges which will present themselves in 2016. Wishing everyone a Blessed Christmas and a Happy Safe and rewarding New Year! Dian is one of our regulars at Fusion Op Shop Kambah and has been coming to Kambah Village, where our Kambah store is located, for 15 years. She lives in Queanbeyan. When she retired, she began volunteering nearby, at the RSPCA in Weston Creek. One day she met someone from her past at the take away shop at Kambah Village and struck up a friendship based on her eating there each day she volunteered, as it was easier than making food for herself once she got home to Queanbeyan. She volunteered 7 days a week to love each and every dog at the RSPCA, especially the hard to love ones. 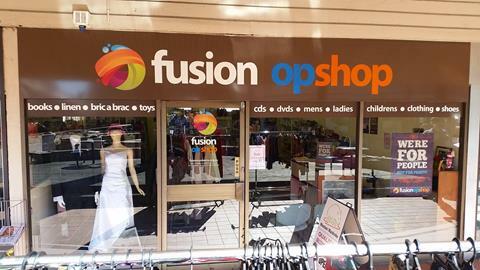 When Fusion Op Shop Kambah moved in last year she came for a “sticky beak” and found “lovely, warm, friendly ladies” and “things aren’t as expensive as other op shops and the quality is really good”. She has also found lots of bargains for her new companion Beasley whom she adopted as a rescue dog from the RSPCA, as a result of her volunteering. He needed a lot of love and Dian has totally spoilt him since September last year. He is now her devoted friend and constant companion. He even has his own spot to lie whenever Mary comes to visit the op shop ladies. They come to visit Beasley’s “Take Away uncles” and “Op Shop aunties” regularly – nearly always on Fridays because Dian says “we like the Friday ladies”. The people at Kambah Village Take Away and Fusion Op Shop Kambah are, in Dian’s words “part of (their) life”. Visiting the Village regularly means company for both Dian and Beasley, plus exercise for them both, as the local oval is perfect for a run for Beasley and a walk for Dian. Dian says it would be “sad for the whole area if Fusion Op Shop Kambah weren’t here. 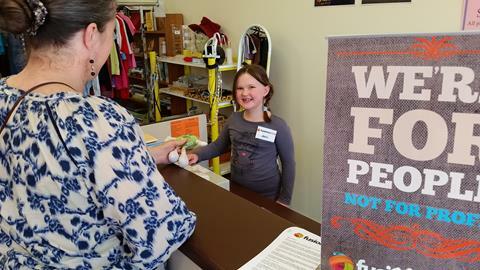 It’s a neat, tidy, organised and friendly environment.” The acceptance she finds at Fusion Op Shop Kambah – especially of Beasley, who is so important to her world means she is not isolated and can be part of life. A couple weeks ago we finished our 4 week long Fusion Families Course that was held at Eternity Church in Kambah. We had 4 first time participants and 3 trainers plus 2 trainee trainers, and 9 kids in child care! It was again such a privilege to encourage, resource and equip those caring for kids to better create nurturing environments where their kids can thrive. A big THANK YOU to Sallie and Joy coming from Sydney to help with the training, and Izzy and Gillian running the child care program so those participants with kids could take part. come and celebrate the year with us! On Wednesday 2nd December, 5-7pm, @ Eternity Church, we will be celebrating 2015 together in a relaxed style over some yummy food. Why not register today? There is no charge, and no expectation for you to pay, it's simply our way to say thank you to you for your support and encouragement this year. Of course you're always welcome to make a donation toward our Christmas appeal! In August 2006, Brenton and Claire Reimann arrived in Canberra to take on the leadership of Fusion Canberra from Ian & Jill I'Anson. They were in their 30's and got straight into growing our schools work and building our centre to be more sustainable financially amongst many other things. They initiated Fusion's first ever Pilgrimage to Canberra, running this for 3 years from 2008-2010 with 500 young people from around the country being impacted deeply by taking part. They spearheaded starting accredited training here in Canberra with 12 people going through Fusion's Certificate III in Youth and Community Work (Christian) from 2008 to 2011. On top of this, they were instrumental in continuing the rebuilding of Fusion's work in Canberra a few years after the 2003 Canberra bushfires had caused such destruction to Canberra and Fusion's work there. Brenton has helped our centre become financially sustainable, not dependent on government grants, and a big part of this was how he led the way with starting our own op shop in Kambah, and taking over one in Kippax that was going to close down. There is so much more that we could say about the Reimanns, with their servant hearted nature and willingness to do whats necessary to reach out to the community and all while not drawing a wage! During their time in Canberra they have also started a family - they now have three beautiful kids - Abbie, Daniel and Caleb. We will certainly miss them, as they head off on their new adventures moving to the country in South Australia and building their own home. But we're also excited about being able to still be connected with them through the wider Fusion family, and Brenton keeps telling us that he'll stay in touch as part of the national role he will be moving into of resource consultancy - supporting fusion centres around the country to grow and develop their resources, fundraising, systems etc. 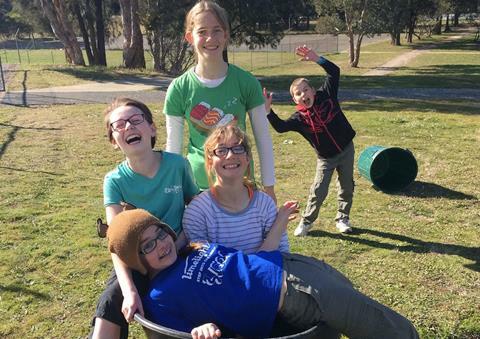 So here's a huge THANK YOU to Brenton, Claire, Abbie, Daniel and Caleb, for your faithful service and growing the work of Fusion Canberra for nearly 10 years. 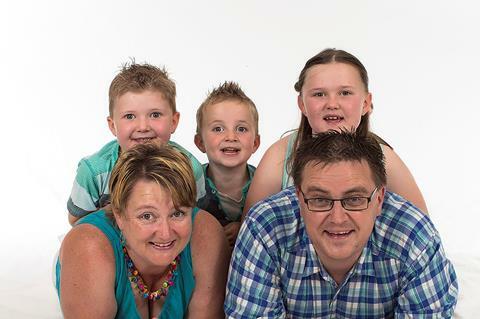 The Reimanns will be moving to the Riverland, SA, at the end of Term 2 (early July). They will finish up their roles with our team early in the year. Did you know we operate two op shops in Canberra? One at Kambah Village (where Woolies is, the main shopping centre in Kambah on Marconi Cres opposite Caltex) and one at Kippax Fair Shopping Centre in Holt. Just between the Newsagent and the Jeweler. Our lovely volunteers at both shops will help you find what you're looking for, and books are only $1!! 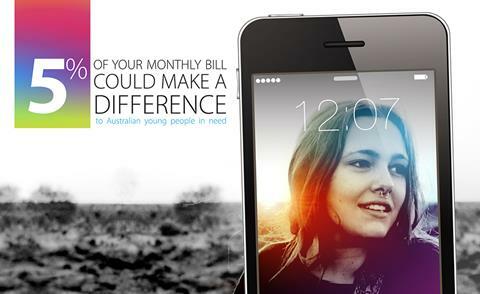 Ever wish that you could use your phone to make a real difference to the world? 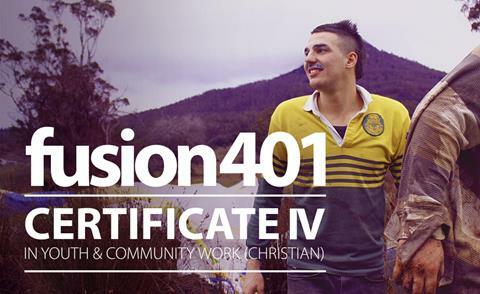 Fusion401 is our accredited Certificate IV (401) Youth and Community Work (Christian) course. Fusion believes that being out in the field is vital to producing passionate, skilled youth workers, and so the course is delivered onsite from a variety of active Fusion Centres. We launched our end of year Christmas Appeal at our 30th Anniversary dinner last month. So far we've raised $17,000 towards our $30,000 target needed to cover our costs in 2016. Can you help us raise the remaining $13,000 by December 31? You have received this Newsletter mailing because you have attended an event, made a donation, volunteered, or signed a petition for Fusion. Fusion produces 3 types of mailings... to unsubscribe from Newsletter mailings of all types, please click on the Unsubscribe link below. To Unsubscribe from ALL mailings (Events and Appeals as well) from Fusion, please click reply and put 'Unsubscribe' in the subject line. Thank you for your understanding.